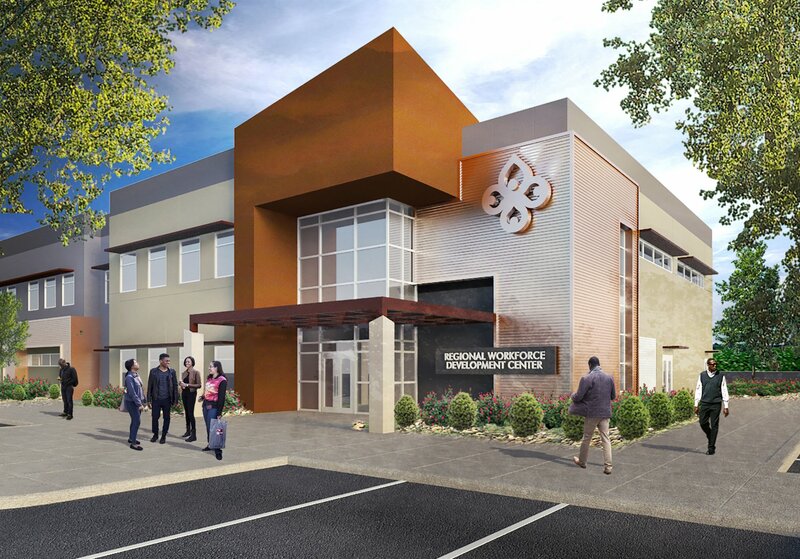 The Regional Workforce Development Center is designed around Nevada Partners’ mission of helping veterans, at-risk youth and others in need of vocational training and other assistance in finding meaningful employment. Vocational training functions on the ground level include classrooms, a community meeting room, a computer lab and call center, and a future skills training space designed to accommodate drone training and repair, among other practical technologies. The second level consists of a consolidated office space for the Nevada Partners team, plus spaces for client meetings and use by community partners. A double-height lobby promotes a special sense of place, and serves as a node of connection to and from the existing buildings on the Nevada Partners campus.